Portuguese love their tiles, or Azulejos as they call them! And they should, since they are beautiful and represent a rich multicultural past. So, after you have probably visited the Azulejo museum, you are now ready to some yourself before flying back home. You have come to the right place. I don’t really like to write about “tile stores” in Portugal, since most of them are a bit cheesy. But this one is the real thing. It opened pretty recently, but it looks already 500 years old, which, in the case of Azulejos, is a good thing. 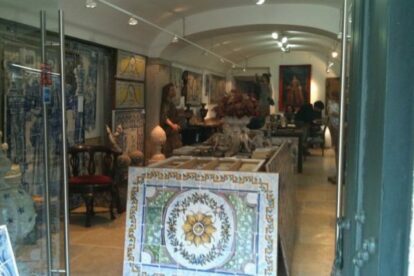 They primarily sell antique tiles (so don’t ask for an azulejo with “Cristiano Ronaldo” written on it please) and are also in the business of restauration of azulejos. Prices range from “I can afford that” to “this is going to be a very expensive bathroom”. Have a look, it is smack in the middle of Chiado and who knows, maybe you will bring a bit of Portugal back home.